Jennifer Hubbard and I were in the Tenners debut YA novelist group in 2010, and we both had novels published that year about boys who lived by the river! 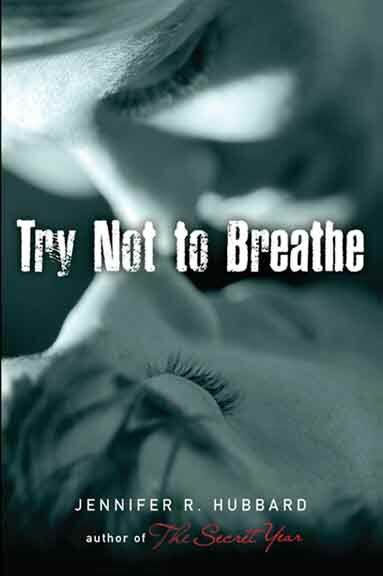 Now, Jennifer has a second novel out, called Try Not to Breathe. She’s stopped by today to answer just a few questions for me. Jennifer Hubbard: At eight, maybe a teacher, though I was also considering “writer.” At eighteen, a scientist and a writer. At twenty-eight, the same. I suppose I’m unusual in that I became exactly what I set out to be at age eighteen. JH: Apparently the Breakfast Club made a much bigger impact on the rest of the world than it did on me, but I guess the one who is closest to my teenage self would be the character Anthony Michael Hall played. JH: There’s a scene in Try Not to Breathe where Ryan, the main character, confronts someone he has been afraid to confront for months. He has built this meeting up in his mind, and yet I knew the character he’s confronting would have a very different take on what had happened between them. I worked hard to make that scene significant, yet realistic. JH: It’s a Mad, Mad, Mad, Mad World. Crimes and Misdemeanors. Take the Money and Run. This is Spinal Tap. Dr. Strangelove. JH: I listen to more Beatles music. The breadth of their material, and the originality of their later songs, is impressive. Bio: Jennifer R. Hubbard (www.jenniferhubbard.com) is the author of the young-adult novels Try Not to Breathe, about a boy’s recovery from a suicide attempt, and The Secret Year, about a secret relationship and its aftermath. Win an ARC of Mindi’s LIVE THROUGH THIS + Cuteness + a Mystery Gift! I loved The Secret Year. I started reading YA about the time I started writing it 2 years ago, and TSY was one I read within that first month or so. It’s the kind of story I’d like to write and it’s stuck with me all this time. So I’ll definitely check out Try Not to Breathe too. Thanks, Suzi–and thank you Mindi for hosting me!